Today’s modern lifestyle has changed the way in which we prepare food. Breakfast is the most important meal of the day and owing to our hectic lifestyle, a majority of the people do not have much time to prepare elaborate dishes. A very easy-to-make breakfast, which can be customized to be healthy by choice of toppings, is bread toast. More often, when preparing toasts the conventional way, you never get the right crisp. With the help of KENT Pop-Up Toaster, you can strike it right with the perfect toast in each slice. Today, a pop-up toaster is one of the most widely used kitchen appliances. This is because operating a toaster is no rocket science and it is fairly reasonable in terms of pricing. There are a variety of toasters available in the market. What makes KENT Pop-Up Toaster so special? Here’s a look at its exclusive features. The revolutionary technology used in KENT Pop-up Toaster has solved yet another frequently faced problem while preparing bread toasts – the level of browning needed. Well, this actually depends on individual taste. With KENT Pop-Up Toaster, you can get the desired level of browning on a toast without burning it, thanks to the 5 browning modes. We all have our tastes and preferences when it comes to food and this toaster gives the right kind of flexibility of taste to all the family members. The lightweight toaster from KENT has an added feature to prevent the burning of fingers – the high lift function. This ensures that even small pieces of bread can be easily removed from the toaster without accidentally hurting your fingers. Bread is available in different shapes and sizes. Most whole grain brown bread is relatively wider than their white counterparts. KENT Pop-Up Toaster has a wider slot that can hold all sizes of bread slices. An immediate action that follows toasting bread is cleaning up the breadcrumbs. The cleaning of an appliance after its usage is perhaps the most exhaustive procedure. It needs care and caution. The same can be said of the bread crumbs left at the bottom of the toaster. With the KENT Pop-Up Toaster, it is easy to clean up the breadcrumbs as the tray is removable. Do you often leave the bread in the refrigerator for an entire weekend? We all do that. 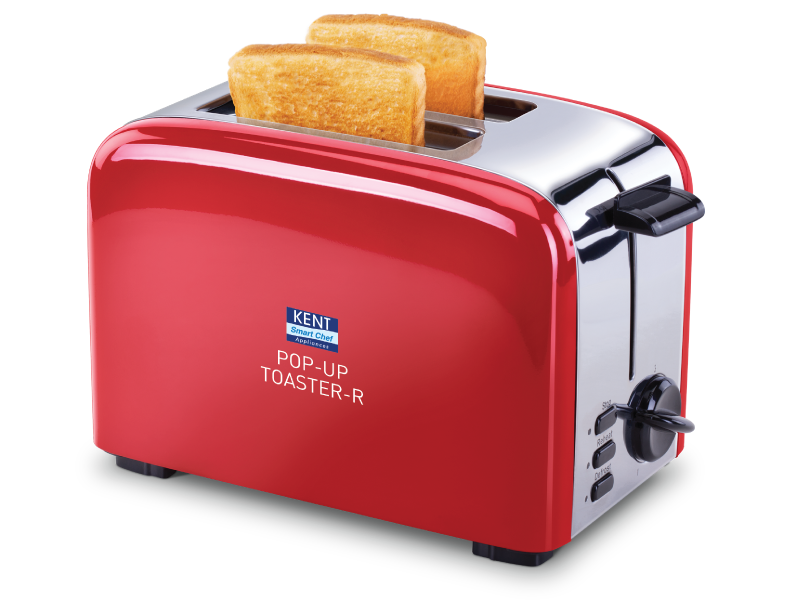 KENT Pop-Up Toaster has a defrost function that thaws frozen bread. This toaster differentiates itself from the other toasters in the market by serving as a multifaceted appliance. It can also reheat a toast efficiently without affecting the taste. KENT Pop-Up Toaster is designed to be very attractive and compact, making it a stylish appliance to make your breakfast. Toasters have been in the market for a long time now, but the addition of new features to suit the modern requirements of a changing lifestyle is what makes them more innovative and no doubt KENT is the leader when it comes to this aspect.